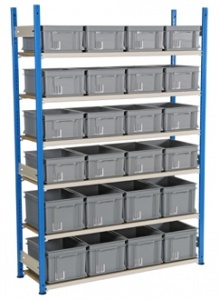 Euro container storage shelving complete with 24 Euro stacking containers. Ideal for picking with the 2 most popular sizes Euro Containers included. Industrial quality steel shelving with 5 fully adjustable chipboard shelves designed to fit 400 x 300 euro boxes and euro stacking containers.